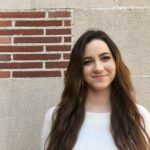 Yevgeniya (Zhenya) Gilmore is a Junior majoring in International Relations Global Business and East Asian Languages and Cultures. She has spent two summers abroad studying Mandarin Chinese through the U.S. Department of State National Security Language Initiative for Youth program and the Critical Language Scholarship program. She also speaks Russian and is currently interning for the Virtual Student Federal Service program through the U.S. Department of State. This semester she is also partaking in the TIRP (Teaching International Relations Program) at USC. Her research interests include foreign policy of former Soviet states, and environmental and human rights issues in China.